Home/Company Links/About Clip Strip Corp. 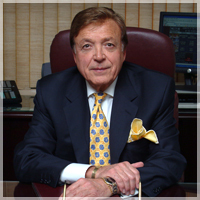 In the late 1970's, Edward Spitaletta, CEO and founder of Clip Strip Corp, had an "Idea" that would revolutionize retail merchandising and in the process, create a whole new industry. As a long time, successful distributor of houseware products, Ed was very familiar with the retail environment. 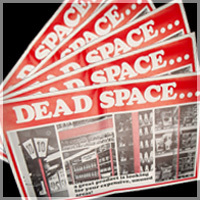 Convinced that the existing, unused "DEAD SPACE" along the edges of retail shelves across the country could be transformed into "Prime Display Space," he began an extensive research campaign and ultimately, developed the first merchandising strip - The Clip Strip® Brand Merchandising Strip. As Edward began to demonstrate the Clip Strip ® to his customers, he learned that he was addressing a need that had yet to be recognized. As one of the early Clip Strip Corp. advertising programs shows, it was first necessary to educate retailers to the fact that their "fully merchandised stores" had an unrealized potential to display yet more product and generate more sales! Only afterwards, could he suggest that the newly patented Clip Strip ® was the way to accomplish both! After customer eyes were opened to the new display possibilities offered by Clip Strip Corp.(especially with impulse items and cross-merchandised goods), interest in Clip Strip ® Brand Merchandising Strips began to develop and grow. With time, Retailers, Manufacturers, Importers, Co-packers and Distributors alike, began placing orders. In 1980, Clip Strip Corp was formed and began to produce Clip Strip ® products by the tens of thousands. The diversity of products our customers brought to us, fueled the evolution of Clip Strips as a brand and the most innovative display strip product on the market. 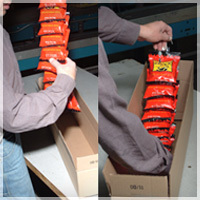 Thirty-four years later, as a direct result of listening to and addressing our customers’ needs, we introduced another strip merchandising product, the "Sticky Strip™”. 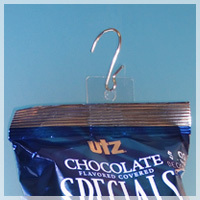 The challenge was coming up with an affordable way of taking snack bags (without mounting holes and without using hang tabs) and displaying them on display strips. The Sticky Strip™ solution employs adhesive stripes applied to a crystal clear strip base. The adhesive holds the product in position & applying pressure is all that is needed to load it - couldn't be easier! At the store level, reattachment is just as easy. If a customer changes their mind, all you do is press it back into position. Because maintenance is so simple, displays always look great! 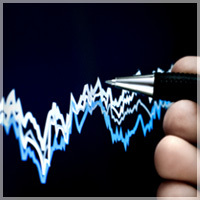 Our R & D Department is always seeking new challenges and welcomes your inquiries and ideas. If we do not currently have a product that meets your requirements, we will focus our extensive experience in the POP industry to find a solution that does. Clip Strip Corp. uses state-of-the art technology to design, develop and test new products. Custom Projects are managed in conjunction with our Research and Development Department. During the entire process, from initial inquiry, through prototyping and to on-site delivery, we will keep you updated with progress reports. Please remember that in order to achieve cost efficiencies on custom products, minimums may apply. 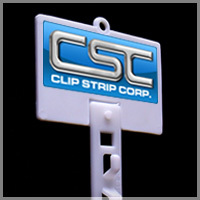 Because customers need more than Clip Strip ® Merchandisers, Clip Strip Corp. is continually expanding it's product line. 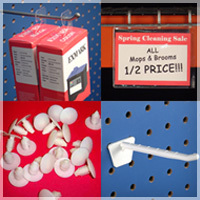 Our Current Product Line Includes: Clip Strips (all categories) / Product Merchandising Systems including Peg Hooks, Hang Tabs and Shelf Dividers / Display Construction Components / Ceiling Hanging Systems / Sign Holders and Literature Holders. The point of purchase and retail merchandising industry will continue to evolve, look to Clip Strip Corp. to continually grow its product line to meet this need. At the present time, we are about to add store shelving components and displays, more sign banner products, shopping carts, slatwall hooks; the list is extensive -all with one goal, to meet the demands of our loyal store merchandising customers. We want your first and subsequent experiences with Clip Strip Corp. to be what you expect from your POP supplier. Our experienced, professional staff will listen to your needs, suggest products that best meet them and arrange for on-time delivery. If you know exactly what you need, your precious time will be respected as we make the order process as quick and efficient as possible. Same Day Shipping: If you require something in a rush, count on CSC to meet that need head on! Maintaining an efficient inventory management system keeps us "ahead of the curve" and allows us to ship most in stock orders same day. We do ask that you phone/fax in your order by 3:00pm EST (12:00pm for truck shipments) "Same Day Shipping" is by request only. Office Hours: 8:30 am to 6:00 pm EST.